This visual conversation across two generations presents drawings by Jack Bilbo (1907-67) – self-taught artist, adventurer, author, gallery owner, egotist and legendary bohemian – exhibited alongside works by his grandson Ben Woodeson (born 1965), a contemporary British artist known for making confrontational and often deliberately dangerous sculptures. 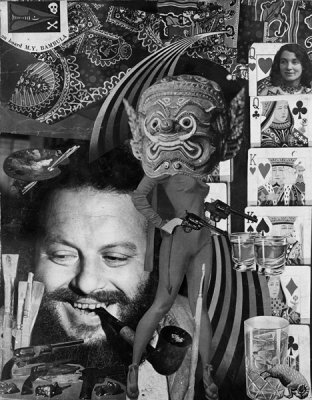 His friend Kurt Schwitters described Jack Bilbo as “the art gangster”, and in fact Bilbo claimed to have “carried a gun for Al Capone” in the early 1930s. An intense individualist and an anarchist with a complex emotional and intellectual heritage from his German-Jewish family, Bilbo was born as Hugo Baruch in Berlin. He had to flee Germany after campaigning against the Nazis, and eventually settled in London in 1936. After being interned in 1939 on the Isle of Man, he returned to London. He founded the Modern Art Gallery in 1941 where he showed works by Picasso and Schwitters alongside unknown artists, and held evening readings of Dadaist poetry and his own fantastic stories. After the war, Bilbo moved to Weybridge where he created giant primitive figures in cement in the garden of his home. 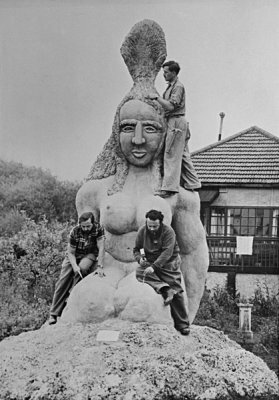 Featured on Pathé News, these attracted press attention and local hostility – after Bilbo moved on to France in the early 1950s, the new owners of his bungalow had the sculptures destroyed by dynamite. Bilbo eventually returned to his native Berlin where he opened a bar and curio shop/gallery. The first solo exhibition since his death in Berlin in 1967 was held at England & Co in 1988 – a retrospective that led to the British Museum acquiring the set of macabre ink drawings that he made for his book Out of My Mind (1946). Many of Bilbo’s drawings reflect the Socialist outlook and anti-Capitalist views he shared with other German artists such as George Grosz and John Heartfield. Bilbo’s satiric drawings with their ironic captions convey his deeply felt political ideas – he took the role of an outsider in his life and work, and was a passionate and irreverent social critic. Some drawings depict his bizarre, sometimes sexual, and often violent fantasies: they emerged from doodles and improvisations and reflect his obsessions. Although visually sophisticated, Bilbo was a self-taught artist, and his work has an affinity to that of other self-taught, Art Brut or Outsider artists. In 2013, a selection of Bilbo’s drawings were shown in Glasgow at the SWG3 gallery in the exhibition Woman expecting triplets returning home from the cinema: Aaron Angell & Jack Bilbo. Ben Woodeson never met his grandfather, but grew up surrounded by Bilbo’s works and a family legacy of anecdotes about his larger-than-life grandfather. He shares Bilbo’s “sheer energy and single-mindedness” and likes to make work that is – in his own words – “difficult and confrontational”. He constructs works that often make people very nervous about what might happen. Mark Sinclair, in an exhibition review of Woodeson’s Florence Trust exhibition in 2012, pointed out that “as his precariously balanced glass pieces demonstrate, the fear of what might happen next is at the very centre of his work…”. Some of Woodeson’s works are calm, stable and self-contained, while others confront the viewer with overtly catastrophic outcomes. He admits that “most of what I do does entail some form of risk”, and often purposely focuses his audience with necessary hazard and liability waiver forms. 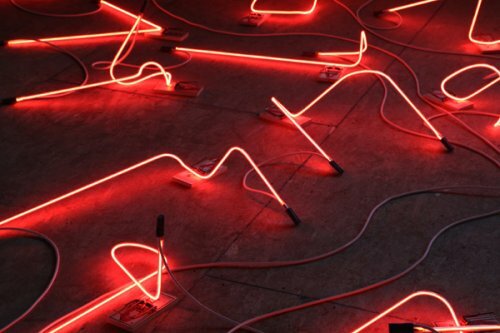 He says that he intends his work to be difficult and confrontational: “fear, fire, gravity, electricity, breaking glass and general sculptural carnage”. Ben Woodeson is based in London and has exhibited extensively in the UK, Europe, North America and Japan, most recently in the group exhibitions Hackney Wick Takeover at the Victoria and Albert Museum (2014) and in The World Turned Upside Down, Mead Gallery, Coventry (2013). Woodeson was awarded the Theodore Randall International Chair in Sculpture, Fellowship, Alfred University, NY, USA in 2013. The title of this exhibition Twelve-Fisted Boxing Caterpillar, inscribed on a drawing by Bilbo, resonated with Ben Woodeson, who thought that it could have been apt for one of his own works and encapsulated a penchant shared with his grandfather for giving works surreal, bizarre, absurd, crude, or humorous titles. An illustrated 40-page catalogue will be published by England & Co to accompany this exhibition.